When I was little, my family spent a lot of time in Pensacola, Florida. My memories are strongly linked to smells and tastes so a few things remind me of my childhood spent on white beaches. 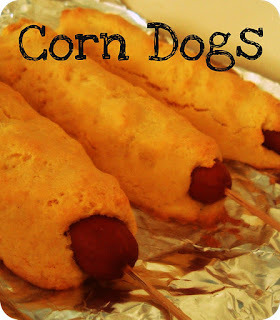 The other is corn dogs. I had a weird hankering for them the other day but wanted to make them rather than buy a boy of froze pogos. I also wanted to try and bake them rather than deep fry them in a pot of oil. A quick google search gave me a good place to start. 1. Mix together 1 cup flour, 1 cup cornmeal, 1 tbsp granulated sugar, 3 tbspbaking powder, and 1 tsp salt. Mix in 1 egg (whisked), 1/4 cup vegetable oil, and 1 cup of milk. Add in the milk 1/2 cup at a time, keeping the consistency thick enough to shape onto each hot dog. 3. Preheat oven to 350 degrees. Skewer hot dogs with wooden sticks. Using your hands, mold the batter around each hot dog and place on a tin-foil lined baking sheet. 4. Bake for about 20-30 minutes or until the corn batter is set but not too brown. Serve with mustard for dipping. My batter was too thick so it made it hard to eat properly but it'd be worth trying again. That's awesome! I thought it would be way harder. I'm definitely going to try this. Thank you for educating me (and presumably others).